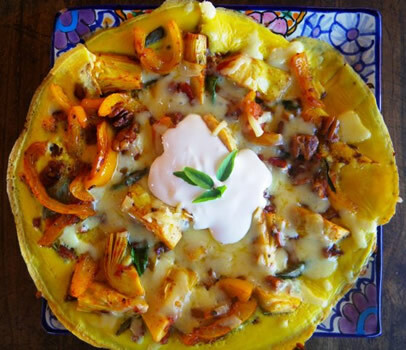 I have been living in Mexico for almost 7 years now and I love fresh ingredients and I love to cook and, as you can see by my website, I just love to share!! Here are some of my favourite things to whip up. Most don't take long at all and are simple and delicious. I hope that you enjoy making and eating this yummy food as much as I have! The Tastiest Coffee You've Ever Tasted! I couldn't find my other older photos of my coffee maker but once I'm back in Sayulita I will find them and post them - for now you just get this leg shot, sorry about that! You fill the water only up to the pressure release gadget in the bottom of the coffee maker. Then you put it together and spoon the finely ground coffee into the holder. Don't pack down hard - just fill it up and pat. Screw the top on the coffee maker and set it on a medium heat. Then, get your small saucepan and pour in about 1 cup of milk (or however much you think you'll like), turn it on medium/high and both the coffee and the milk should be ready at about the same time. Scald the milk (it will bubble up). Then.....oooooh yes....pour the coffee and the hot milk into your vessel (I use my old Paris cafe au lait bowls just for this) and add honey to taste. You will be in heaven, honestly! 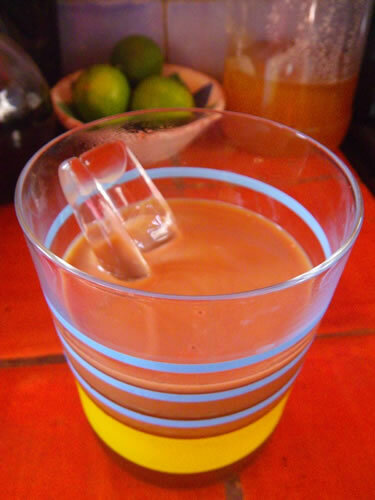 This leads us to the Tastiest Iced Coffee you've ever tasted! Here is my Grandad's famous (to our family at least) Green drink! He was born in 1903, was into organic gardening (mom just showed me some of his old organic gardening magazines/newsletters from the 60's), always had a big garden himself, soaked his grains overnight and then had them with water and always made this green drink with whatever was in the garden, weeds included! It is SO delicious. Whenever I'm at my mom's place she whips one up every morning. You can feel the goodness vitalizing all your cells! You wouldn't think it would be so tasty, but it really is! Enjoy! I finally got to make my Grandad's Green drink in Mexico when an organic market finally came to town and supplied me with organic kale - yay! Allll blended up into delicious, thick, nutritious yumminess! Down here verdolaga (purslane) volunteers in all my pots and in my garden all year round and I just discovered that it has the highest amount of Omega 3's in ALL the vegetable family! Cool eh? Plus lots of anti-oxidants and minerals and vitamins too. I'm stoked. This drink tastes SO vital. 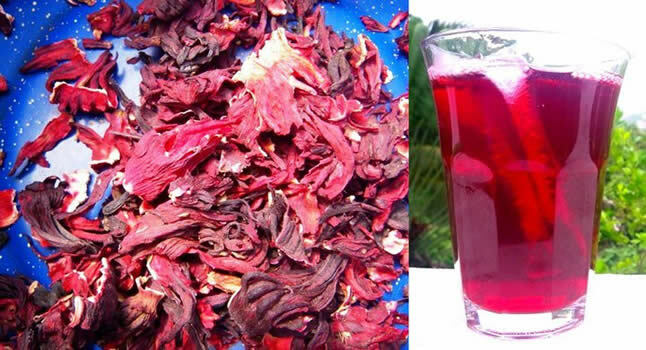 Jamaica (pronounced: HA MY KA) is a drink made from hibiscus flowers - yes! Beautiful isn't it? My absolute all-time favourite salad right now: Beet Supreme! I discovered the oh-so-incredibly-yummy combination of steamed beets with avocado when my friend, Erin, made me a delicious salad of beets, avocado and a few other ingredients. I started to experiment with this new pairing discovery and made my own version. You are sure to love it...the flavours in every bite just marry so well! Cut your beets into bite-sized chunks and steam them for13 minutes. Meanwhile toast your pecans (after cutting them into rough thirds) in a dry frying pan...flipping them over to toast on all sides (toasting brings out flavour flavour!). That just takes a few minutes. Tip them out into your big salad bowl when they are done. Then, in that same frying pan sautee some mushrooms in butter and salt and pepper. (mmmmm) Throw everything together in a bowl with the avocado cubes, basil and the cheese then drizzle the olive oil on top and squeeze over the lime. Toss and enjoy every little bite! I discovered that small raw broccoli florets marry SO well with pecans and really go well with this salad so if you like broccoli this is a great addition. Another super yummy dressing is pesto + balsamic vinaigrette stirred up in the bottom of the bowl before adding everything and tossing. Oh my goodness, it's to die for. PS: Beets are very good for cleansing your blood and liver - and are excellent blood builders. They are loaded with vitamins A, B1, B2, B6 and C.
Dice it all up and toss with the olive oil, squeeze of lime, dash of salt and fresh ground pepper.Yum yum super fresh! Now, this salad takes a little longer to make but boy is it worth it! 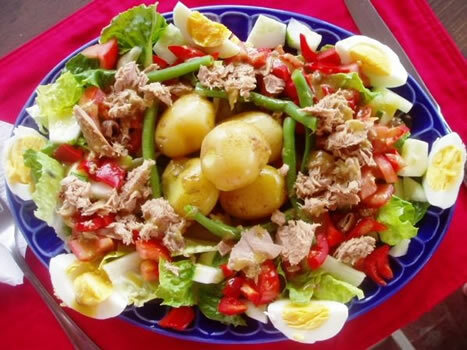 It is the perfect salad for a mid-afternoon summer's lunch. It's my all-time favourite and make sure you don't skip the dressing - the dressing is what makes it! 1. Boil the potatoes in sea-salted water (potatoes like salt!) for 6 minutes then drop the green beans in on top of them for another 7 minutes. They will both be perfectly cooked. 2. Just cover the eggs with cold water, put the lid on, and heat until boiling. Once it's boiling, turn the heat down a bit so that it's an easy boil and put the lid on askew so air can escape. Set your timer for 6 minutes. This will give you perfectly cooked eggs...a slightly sticky yolk...mmm mmmm! 3. 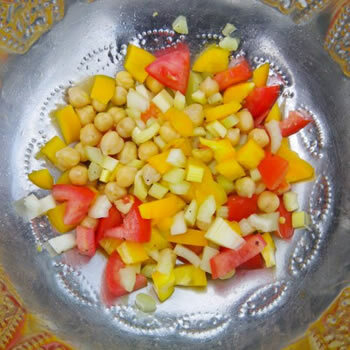 Make the dressing: Place the mustard, crushed garlic (optional) in a bowl. Finely chop up the anchovies. Add to the bowl and squish together with a spoon. Season with pepper and then stir in the lemon or lime juice. Whisk in the olive oil, slowly. It won't look very appetizing but, boy, is it tasty - just you wait! 4. Put your cooked potatoes into a separate bowl to cool and drizzle with some of the dressing, just so it permeates a bit. 4. Chop your tomatoes, cucumber and red pepper into small chunks. 5. Now, to build this beauty! Get out your big plates and arrange the lettuce around the edges and the bottom, leaving a space for the warmish potatoes in the middle. Add the potatoes in the center and then surround them with all the chopped vegetables. Arrange the eggs and green beans. Add the olives and tuna and then slowly drizzle the dressing all over it. Garnish with basil. 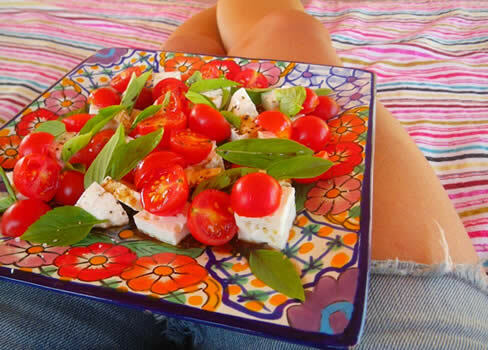 Put the cherry tomatoes, cheese and basil on a plate then drizzle with olive oil and some balsamic vinegar. Add a touch of salt and some pepper. Delicious. Tear up the clean lettuce into crunchy bite size pieces (when the lettuce is big it's just really difficult to eat and it's not as enjoyable! 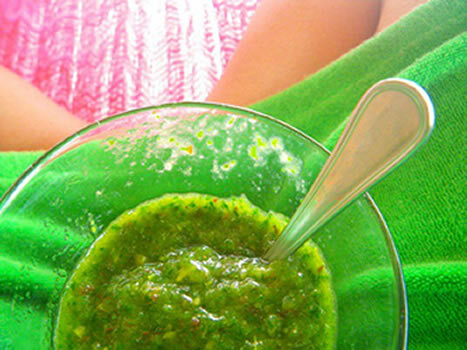 ), add all the ingredients and toss with olive oil and lime juice. Voila! 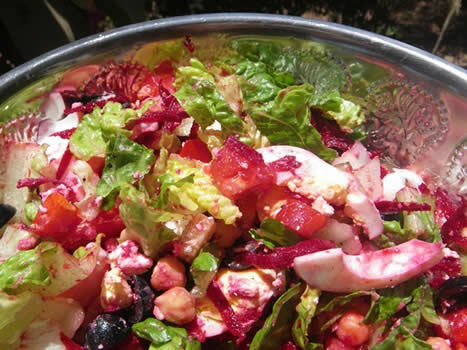 PS: Edgar Cayce always said to have at least one raw meal a day: One big salad chock full with many ingredients, so that you get your enzymes! I think it's a fantastic idea. This is very quick, tasty and good-for-you miso soup! I had nothing in my cupboards the other day so I decided to put this together for the first time ever...it hit the spot. I boiled some water and then dropped the carrots and celery and kale in the boiling water for 2 minutes then turned the heat off and added the miso soup paste (already made into a slurry with some of the hot water for easy adding). Stirred it up and it was ready. That's it! One of the many soups I make throughout the winter. It's so easy to make a huge pot and then warm up small pots of it as you need it. Some buttered toasted baguette to dip in it and you've got yourself a full meal! Melt your butter in your big pot (I just love my Le Creuset pot) and add your onion, carrots, celery and red pepper. Sautee and simmer until totally soft (maybe 15 to 20 minutes). Sometimes I add a little water if they are sticking too much and cover for the second bit of cooking. This will be the base flavour of your soup. Add the chunked zucchini and cook for 8 minutes or so. Add your sweet potatoes and cooked beans and stir. Add your hot water and then bring everything to a boil. Add salt to taste (probably at least 1 teaspoon to start). Then lower to simmer the soup with the lid on askew for about 20 to 30 minutes until the sweet potato is cooked. Check the salt level and add fresh group pepper. Ladle into your bowl add a dollop of soup cream and have with toasted baguette with butter dipped into it. MMm mmmm yummy! 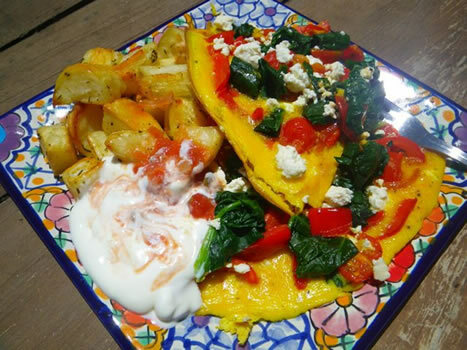 There are many variations for a wonderful omelette, here are a few of them but please do experiment! I love making my omelette's open-faced because then they still look gorgeous... You'll want to prepare the roasted potatoes first and then while they are cooking you can make the omelette. In a big bowl place your chunked potatoes, a fair amount of salt sprinkled, pepper, the rosemary and a good amount of olive oil drizzled. Take two utensils and toss like you would a salad. In no time at all the olive oil has coated everything. On a cookie sheet or baking dish arrange the potatoes, skin side down, just so that they are not touching each other. Bake for 40 to 45 minutes or until they are golden. Steam the chard, spinch or kale in a steamer for 3 or 4 minutes until totally wilted. Serve up the rosemary roasted potatoes and you have a breakfast or lunch (or even dinner) feast! If you like mushrooms then you will love this - a very simple (sometimes simple is the best, yes!?) mushroom omelette where you don't add a whole pile of other ingredients because you really want to taste the mushrooms! Sautee the onion and peppers up in some butter with salt and pepper and cook until nicely soft and even caramelized a bit, then add the artichoke hearts and nuts (toast them in a dry pan first if you want more flavour) and sautee on medium for a few minutes. Then, pour on the egg and follow the method above. When the egg is don add the cheese and fresh basil. All done! Delicious. Sides or small meals in themselves! Home-made Organic Pesto made in a Mortar & Pestle! Pesto made the old-fashioned way with a mortar and pestle! Put on your pot of water to boil and then go fetch your basil. I have a very small mortar (it holds 1 cup of liquid comfortably) so I filled it up with basil leaves (loosely packed, as shown) and added the salt and started pestle-ing. At first I thought: how the hell? Then I just did the round round round action and, voila, within less than 30 seconds it was all pulverized! Seriously! The amount of pulverized basil was tiny, though, so I filled it up with the same amount again and went to work for another 30 seconds. If you're using raw garlic (I don't because it gives me a headache) add it now along with the nuts. I added them whole and then just pulverized them with a straight down action (honestly, this is the most exercise I've gotten all summer - I should make pesto more often!). It's pretty fun. Then I added the fine parmesan. Then I added the olive oil 1 tbsp at a time. Done! Once the pasta was done I drained it and then put it back in the hot pot...spooned the pesto into it and mixed thoroughly (for good coverage)...then used my fantastic le creuset spatula (they truly are super) to get every last bit of pesto out of the pot and into my bowl. Grate some parmesan on top and mmm mmm enjoy. This is probably enough to do two servings but I ate it all in one sitting (oh my) - I couldn't help myself! Deeeeelicious!!! Sardines! You either love 'em or hate 'em...I happen to love them...especially done this way. Yum yum yum. 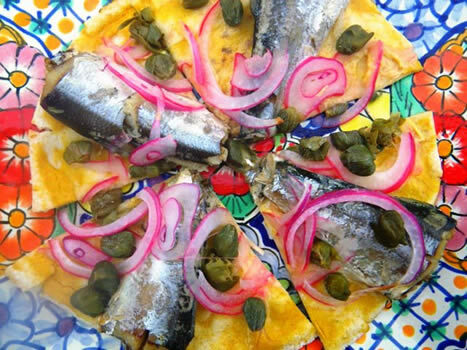 Spread some dijon on your pita bread, lay the sardines down, sprinkle with as many capers as you want (I like lots), and top with thinly sliced red onion. Sprinkle with a little olive oil. These last couple of years I have grown my own Suyo Long cucumbers (the crunchiest, most delectable cucumbers I've ever tasted in my whole life, I have to say!) 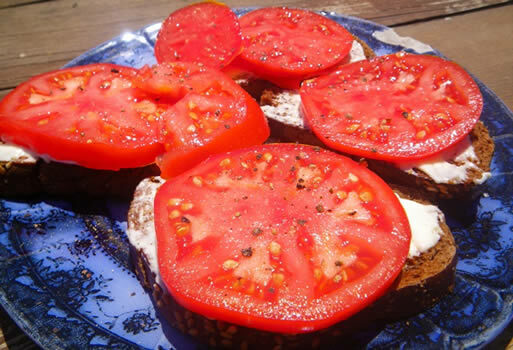 and my own tomatoes, too (but not the ones pictured above....see the ones below...mmmm mmmm!) There is nothing more gratifying than growing your own vegetables! My best tomatoes are grown in large clay pots on my terrace SO as long as you have some sunshine you can do it too! Soooooo I know what you're thinking: sandwiches aren't much of a recipe but these ones are pure heaven and I'm just reminding y'all that the simplest thing can be a taste sensation. The freshest organic cucumbers and tomatoes from your garden (or your nearest organic garden! ), your favourite bread, whatever it may be, all add up to a perfect snack. Toast and butter your bread, slather in mayo (the cucumber sandwiches are good with dijon, too! 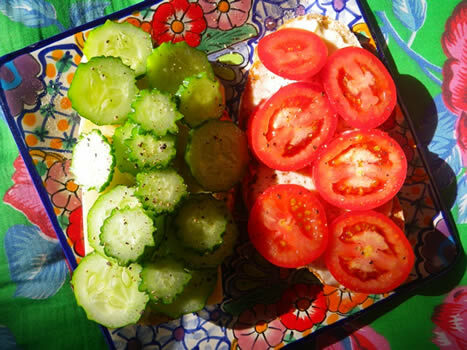 ), top with the cucumbers or tomato slices and shake some salt and pepper over top. Enjoy! 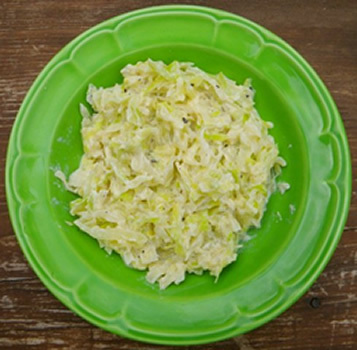 Here is our family's famous (to us) Great GrandSmothered Cabbage recipe - time travelling all the way from the 19th Century! My mom called this GrandSmothered Cabbage but, to me, it's Great GrandSmothered Cabbage...passed down from my Great Grandmother, to my Gran then to my mom and finally, to me. It's super simple and tastes delicious. Put it all in a frying pan, cover and bring to the boil. Once it's boiling you can remove the lid. As it is cooking the scent is yum yum yummy....I think it's the freshly ground pepper that does it! It'll take about 15 minutes to soften the cabbage and soak up all the milk. When the milk's all gone, it's ready! I tried it once with cream because I didn't have any milk and, oh man, WAY toooooo rich. The milk is just perfect. You can also make it with chicken broth for something different. Very tasty too. Buen provecho! A Potato-Lovers Dream - soooooooo easy! Who doesn't love roasted potatoes? Halve and then cut the potatoes into wedges - either 3 or 4 per side depending on the size of the potato. Throw into a bowl with the above ingredients. Toss like you would a salad to coat the olive oil and spices. Put all the wedges, skin side down, on a cookie sheet or casserole dish and pop in the oven at 350 degrees for 30 minutes for the sweet potatoes or yams or about 45 minutes for the regular potatoes. No turning them, nada. Easy as pie! I often make a combination of potatoes in one batch and don't bother taking the yams or sweet potatoes out early - they don't seem to get too overcooked with that extra 15 minutes. To compensate you could cut them a little thicker than the regular potatoes. You can make roasted vegetables exactly the same way as the potatoes - just omit the rosemary. They work the best if they are only one to two vegetables thick on the roasting dish - because if you pile them up they'll never brown. Bake for 45 minutes. At about the 25 minute mark you might want to give them all a stir and flip. When they are ready I drizzle the roasted vegetables with a little balsamic vinegar and tossed in some fresh basil. MMM mmmm. You can eat them just like that, right off the plate or The Re-Bar Cookbook (from my home-town restaurant by the same name) suggests making some quesadillas out of the roasted vegetables by spooning the roasted vegetables onto one side of a quesadilla shell then adding some cheese - which I've done many a time. Asiago is mmm mmm super! You don't need much asiago cheese, though, to do give the quesadillas some zing! Mmmmm mmmm! I got these gorgeous Flor de Calabaza's at the farmers market. Aren't they stunning? AND they were super tasty as well (who knew? I had never made them myself). 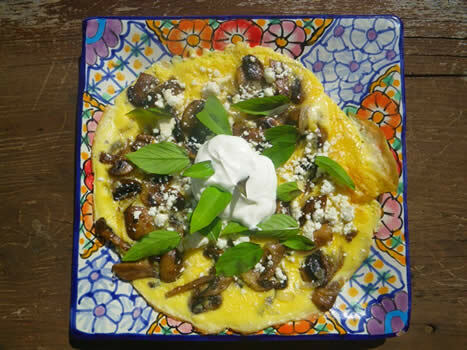 I just sauteed some mushrooms in butter, salt and pepper and then sauteed the flor's too and laid them out on a corn tortilla with some of the fresh queso fresco I got at the farmers market too. MMmmm. Simple, tasty fare! In Mexico this is how they make their tacos: open-faced like this. You just pick them up and they naturally fold into the 'known' taco shape and you can munch them that way. Well, I can't take credit for 'making' these mangoes but that doesn't stop me from enjoying them! I remember back in Canada not buying mangoes because I didn't know how to get in to them - they always seemed SO difficult to eat (perhaps I'm lazy). But this is a super easy enjoyable way to eat them! Stand the mango up on it's end and cut down on either side of the long pit. You'll be left with two sides and the pit middle. 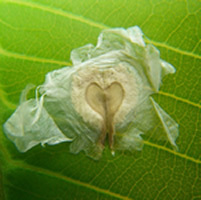 Peel the pit middle and nibble the flesh along the edges. 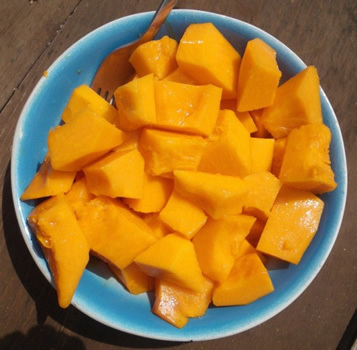 Then score the halves like this and then, turn them inside out and, voila, perfect little cubes of mango that are easy to eat straight off the skin. Mmmm mmmm. The other, local way, to eat them is to simply peel them like a banana, while holding the bigger base and just launch into it. 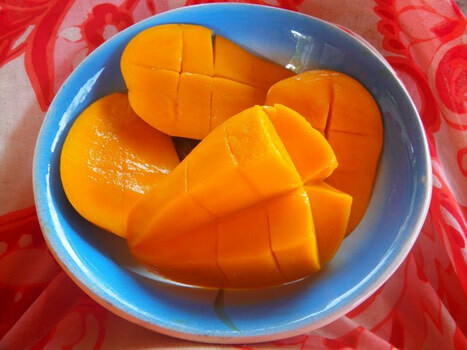 I have many mango trees and there is nothing more pleasurable than eating a mango like this that is still warm from the sunshing! 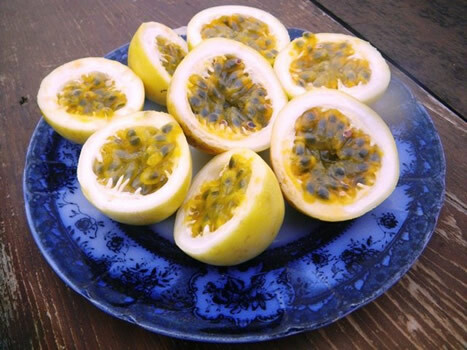 The first time I tasted a fresh passion fruit right off the vine, I thought I'd died and gone to heaven. Wow. I could taste the vitamin C - they just tasted to vital and healthy and good for you! You just cut them in half and then scoop out the insides with a spoon - crunch away on the seeds and all. Mmmm mmmm organic papaya from my trees! I swear, I have never tasted a sweeter papaya. The secret to enjoying the taste of payapal is to always squeeze lime over it. Always. The two flavours just marry so well. Ya gotta have the two together. Delicious! Mangoes cubed or any other fruit you like! Butter a baking dish. Mine is 9" X 12" and 2 1/2" deep. Get another, bigger baking dish, to set this one in then boil some water so that you have some hot water ready to fill the second baking dish with so that your bread pudding is actually 'bathing' in the hot water bath. 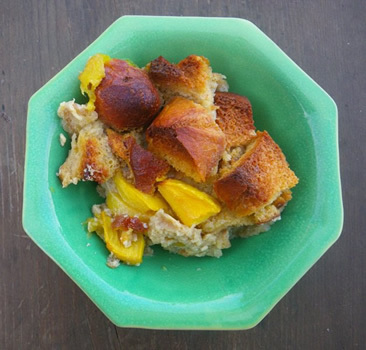 This method is fantastic because the bread pudding stays moist and doesn't burn on the bottom. It is super easy even though it sounds complicated! 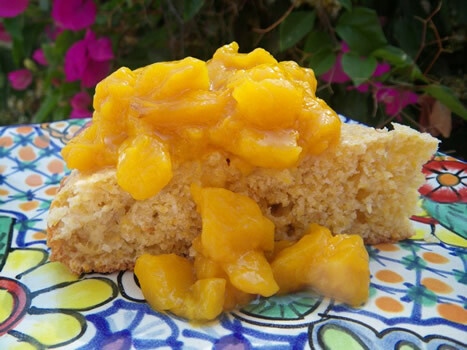 Cut up all your stale, hard bread into 1" (or even a little smaller) chunks and distribute evenly among the fruit chunks directly in the baking dish. Beat the eggs and sugar together for about 4 minutes. Add the vanilla, cinnamon, salt, melted butter, the milk/cream and the splash of brandy or rum. Beat until mixed. Pour over the bread and fruit. With your fingers make sure that every piece and side of bread has been soaked with the liquid. The bread tends to float so press down and turn around just so no bread is left dry. Set your dish of future yumminess into the other baking dish and place in the oven. Then pour the hot water into the second baking dish that your baking dish is sitting in. Make sure it doesn't overflow into your own dish! I thought mine was done perfectly - very soft and moist and yummy inside with only tips toasted and chewy - not at all dry and crisp. Suuuuuuuper YUM. Enjoy! Not sure how I discovered this. I have a feeling I combined Edgar Cayce's information on pears being very healing for your lungs and respiratory system with Traditional Chinese Medicine's information on how warm pears, in particular are very healing. Whenever I have a bronchial or lung thing (coughing up stuff) I think: pears, since they are healing for the lungs. 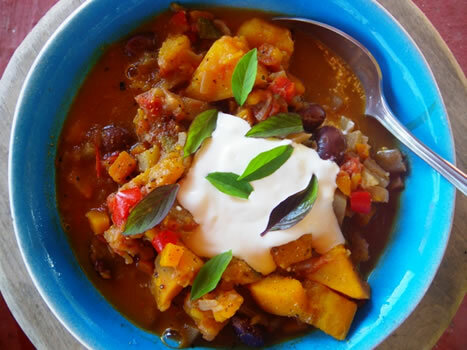 This recipe is super fast, tasty, warming and healing. Just place them on a baking dish like this and put them in the oven at 350 degrees for about 20 minutes or so. 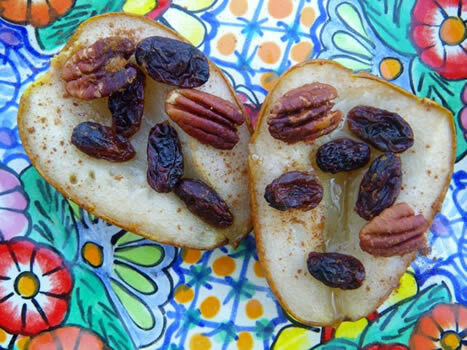 Biting into the pecan with some pear was like eating a pecan pie - I'm serious! PS: if you have chronic lung and allergy issues do Edgar Cayce's 3 day Pear fast instead of apples. Soooo healing! Read all about my step-dad's experience with cleansing and how he cured his life-long hay fever here. 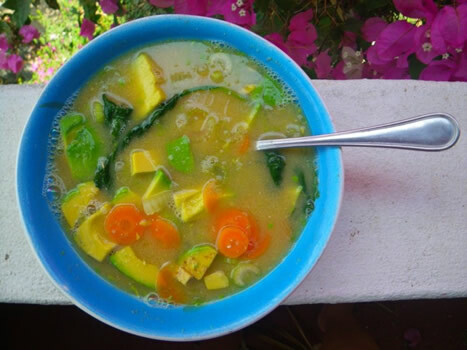 I just love tropical flavours and prefer cornmeal to wheat flour (when possible!) Soooooo dreamt up this concoction to satisfy my sweet tooth. Hand beat the egg in a big bowl. Mash the banana into the bowl. Add the coconut milk and the butter. Stir. In another bowl mix the cornmeal, flour, baking powder and salt. Add the dry stuff to the wet bowl. Stir until completely mixed. Pour into a greased pan (I used a 9" round springform pan but you can use a bread/loaf pan too) and bake for 20 minutes. It might need another 5 minutes. Check it by inserting a skewer - if it comes out clean you're done. To make the compote I just diced up fresh mango and poured about 1/2 cup of water into the pan and then boiled it until there was no more liquid. I didn't add any sugar just cause I don't think it needed it. The other topping that was fantastic was fried bananas! Slice bananas in rounds and fry in butter on both sides. When they are browned pour a bit of rum into the frying pan, swoosh around and then squeeze some lime in there, too. Top the cornbread with that - then drizzle with some coconut cream. Woah. This page links to all my various on-site Cleanse Pages, too. Happy Healthy Body, Mind and Spirit! !